We consider social distance games, where a group of utility maximizing players, connected over a network representing social proximity, wish to form coalitions (or clusters) so that they are grouped together with players that are at close distance. Given a cluster, the utility of each player depends on its distance to the other players inside the cluster and on the cluster size, and a player will deviate to another cluster if this leads to higher utility. 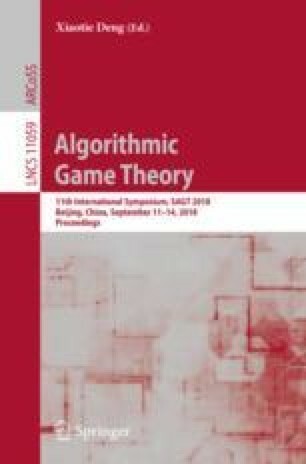 We are interested in Nash equilibria of such games, where no player has an incentive to unilaterally deviate to another cluster, and we present bounds on the price of stability both for the normal utility function and for a slightly modified one.